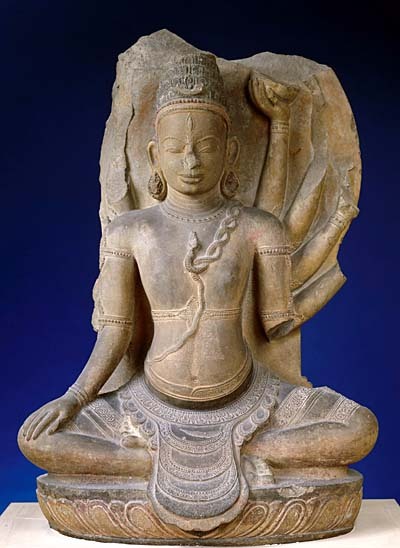 This sculpture represents Shiva, recognizable by the third eye on his forehead, the crescent moon fastened to his ascetic’s chignon headdress, the snake-shaped Brahmanic cord on his chest, and the skull goblet held in one of his hands. Seated on a lotus-shaped plinth with his back propped against an ogival stele, the god is inscribed within a triangle, as frequently the case in late Champa statuary. The bearing of the body, the eyes with their horizontal lower lids, and the treatment of the hair are all typical of the art of the Cham kingdom. The sampot, carved with cross motifs, is bordered with rounded pendants and, along with the meticulously executed finery, bears the hallmark of the Thap Mam style. Although the modelling is extremely fluid, the coolly detached stylization and the chosen method of adding the extra arms (which seem to be stuck artificially on the figure’s back) are also constituent features of this style. This Shiva was originally housed in a 25-metre-high kalan or shrine tower. Most Champa human imagery is Hindu, and this particular image is a cross between the My So’n A1 -the golden age of Champa architecture and sculpture- and Thap Mam styles. The latter was most abundantly represented in the Binh Dinh region, and attests to the development of an original art, nevertheless strongly influenced by Khmer tradition of the same period.